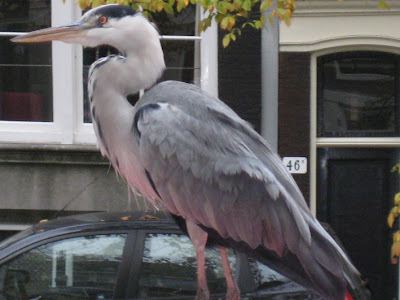 This is a Grey Heren (Heron in English). I pass him every day on my way to work. A very noble bird, is he, always completely motionless and nonplussed by the zoooming cars and bikes around him. I found out lots of information about my Heren online, especially liked the description of his '...heavy dagger-like bill'. But there's one thing I've observed that hasn't got a mention yet, they love the colour red. My Heren, at least. 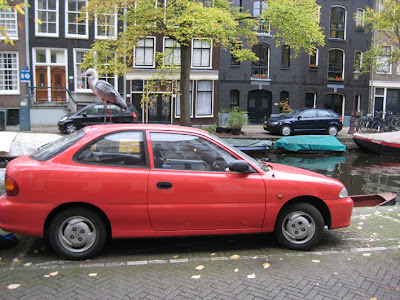 There are many cars parked along the canals, my Heren will only stand on red cars, and if there are two next to each other, he picks the more modern one. I wonder if the lady Heren's are impressed as I am? Reiger is the Dutch name for Heren. Marc van Fucht, made the documentary "Schoffies". You can view the movie during the upcoming International Documentary Festival Amsterdam. See http://www.schoffiesfilm.nl for more information.